We just got back from Modern Apizza in New Haven. Modern is the third member of the Holy Trinity of Pizza.The first two are Pepe's and Sally's. The most amazing thing is that we were able to get right in. No wating. No line. No nothing. The pizza's were delivered to our table with-in ten minutes after we sat down. Talk about service! We ordered three pizzas: a Clam Pizza, an Italian Bomb (pictured above), and a Cheese, Peppers and Onions. Incredible! We were all surprised at how quickly our pizzas were delivered. The pizza was different from Pepe's and Sally's Apizza but certainly right up there in quality. The pizza was probably the thinest crust I have ever tasted. 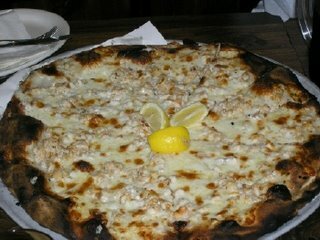 The clam pizza was served with lemons and had a creamy cheesy taste. All of the pizzas had a generous amount of toppings. There was no skimping in that department. It almost seems to me that Modern Apizza may be the absolute best kept secret in New Haven. There was ample parking as well. Now because the pizzas are cooked in a brick oven, you need to expect a certain amount of blackness around the crust. According to The Modern Menu: "Our brick oven reaches temperature in excess of 700 degrees. Some pizzas may blacken around the edges and even lose their perfect shape due to contact with the brick floor of the oven." 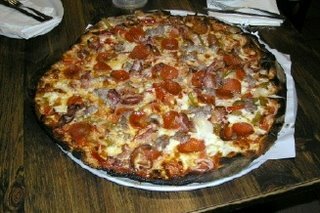 Modern Apizza deserves to be recognized as having one of the absolute best pizzas in the world! None of us had ever been to Modern before, and you can bet your clams, we will return. Modern Apizza is located on 874 State Street in New Haven, Connecticut. Somehow my parents cooled everything down.. and dumped him as a client... but they got their money!.. I am sorry, from my spirit and my soul, and whatever else there is of me, for what I put you through at Bondi's.. when I chased you and hit your car.. and probably gave you a hell of a fright... It's just that I was an employee, and the boss got me so hyped up to do my job, that I was like an out of control robot gorilla... I apologize for any discourse, pain, and expense, I caused you and your family... I have no choice, by the powers that be, but to make it up to you... I must make peace with my god, now.. and you are one of my last things I must do.. and you have no choice in this matter!.. What a fantastic pizza story!